“I’m addicted to triathlons now!” said Jacob Holtgrewe with a bright, wide smile. “My favorite thing is being able to do three different activities all in one competition. 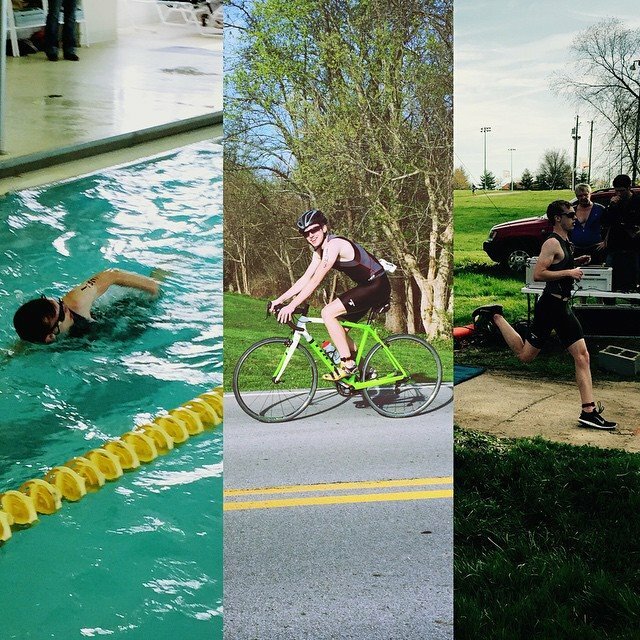 I got to take advantage of different skills and put them together.” In his first ever triathlon, a sprint distance triathlon in Shelbyville, Ky., Holtgrewe finished second in his ‘18-25 men’ age group. What makes Holtgrewe special? He is 19 years old, a number that defies a dominant trend of the sport of triathlon: in 2013, of all athletes that entered a race in the United States, 65% were between the ages of 30 and 49. Only 7% of the total athletes in the sport were under 25 years old. Holtgrewe, along with several other students at the University of Louisville, are part of the Student Cycling Coalition, the parent organization of UofL Cycling, which was formed last year, and UofL Triathlon, which was formed this winter. Josh Goodman, a cyclist and founding member of the Student Cycling Coalition says, “Triathlon is an important part of our organization. It has a broader appeal than just cycling, so it can help bring in a much more diverse group of athletes.” Enter Holtgrewe. However, Holtgrewe is not alone in the growth and expanding youth of the organization. Mike Baird, a 21 year-old junior at the university and experienced triathlete, transferred to UofL from Union College in Kentucky and began competing for the club, earning the overall win at the same triathlon. In an earlier race this year, Audrey Duke and Nicole Knapp went 2nd and 3rd in the women’s 18-25 category. In a recent interview, Goodman said he isn’t necessarily concerned about youth, but about equality. “I would say triathlon helps increase female participation. For some reason a stigma exists that women don’t race bikes, but they like to do triathlons.” Goodman is right, the Olympic cycling development organization, USA Cycling, reported in its annual survey that only 15% of bike racers are women. This figure pales in comparison to the USA Triathlon figure of 40% female triathlon participation. As far as race experience, UofL Triathlon has yet to truly test its race legs. The team will begin collegiate competition in the USA Triathlon sponsored Mid-East Collegiate Triathlon Conference, also known as MECTC, in the fall. It includes any collegiate team in Michigan, Ohio, Indiana, Illinois, and now, Kentucky. In the official announcement of UofL Triathlon in the organization’s website, UofLcycling.com, the team points out it is the only registered collegiate triathlon team in the state of Kentucky. 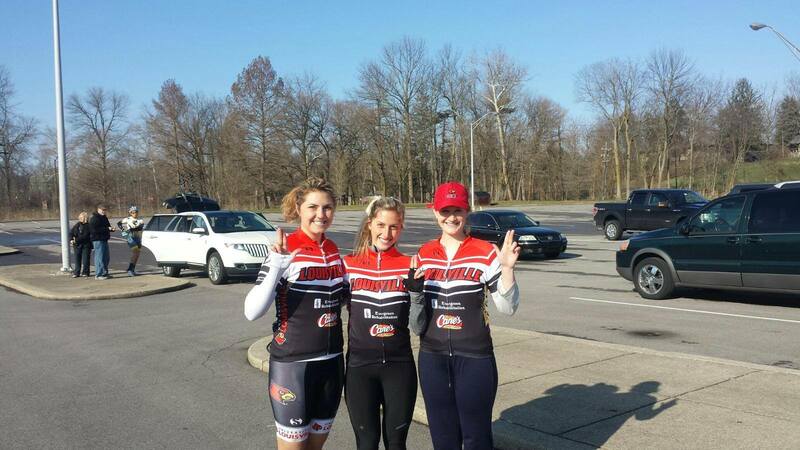 “It is a new way to put UofL on the map,” says cycling coordinator John Francisco. Members of the organization are responsible for buying their training and race equipment, such as bikes, helmets, and shoes. “The barrier of entry to cycling and triathlon is pretty high, given how expensive the equipment can get,” says Francisco. “That is why we have a partner bike shop and industry sponsors that offer discounts to the team members.” However, going beyond personal equipment, funding for the organization comes from local business sponsors such as the Louisville-based care company, Evergreen Rehabilitation, to pay for races and racing expenses. “Racing can be expensive,” says Francisco. Collegiate cycling races cost $15 per entry, and triathlons cost $35, figures much cheaper than the average prices of $35 and $100 respectively for age-group races like the Shelbyville Triathlon that Holtgrewe entered. Then add travel expenses and expansive collegiate race seasons of 8 events in 4 disciplines each, and funding the hobby becomes daunting for a college student. In return for their investments in the team, sponsors get logos placed on the team jerseys. To find out more about the SCC, follow us on Twitter and Like us on Facebook. To learn how to become a member, fill out an interest form. Jacob Holtgrewe in the Shelbyville Triathlon. Audrey Duke, Carolina Ganon, and Caroline Duplessis all joined the triathlon team in 2015. Mike Baird in the Toughman Half-Iron Man distance triathlon in 2015.